Pocket Map and Shippers' Guide of Wyoming. An uncommon 1901 map of Wyoming by Rand, McNally, and Company. Rand McNally first issued this map in 1895. 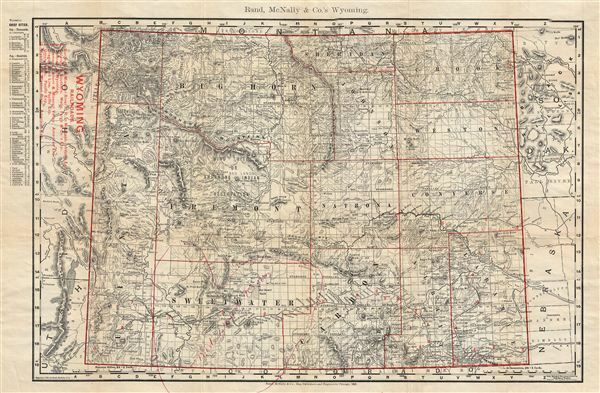 The map covers the entire state of Wyoming identifying counties, rivers, topography and railroads. An index of major cities appears in the upper left quadrant. Someone has added a charming heart shaped manuscript annotation over Sweetwater County identified the ‘Red Desert Region.' Yellowstone Park is included in full. The map is accompanied by its original binder containing a short index as well as advertising. Very good. Light toning on original fold lines. Heart shaped manuscript annotation identifying the 'Red Desert' over Sweetwater County. Accompanied by original index and binder.